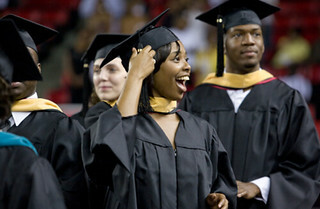 The Gateway to Graduate School Bridge Program allows incoming graduate students from historically underrepresented backgrounds to begin their graduate education at the University of Georgia in the summer semester rather than the fall. The Graduate School defines underrepresented as those who self-identify with an ethnic/racial group, income background, or gender in a particular discipline that has not been traditionally represented in higher education. Underrepresented also includes first generation and non-traditional age college students. 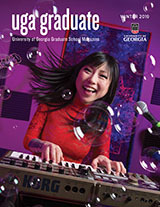 To participate, students must be admitted to the University of Georgia, receive funding from their department or other campus entity, and be nominated for this program by the graduate coordinator for their department. The purpose of the Gateway program is to provide students with an intellectual, professional, and social introduction to UGA as they transition into graduate education. Students will be required to register for three (3) graduate credit hours during the summer thru-session. These hours can include directed study, especially for research projects, or at least one (1) graduate course. The student will receive mentorship, socialization opportunities, and insight into disciplinary research from the faculty in the department. Gateway students will attend seminars to discuss topics such as professional development, time management skills, writing research papers, citation management software, etc. Students participating in Gateway will receive a stipend in two installments during the program. The amount of each stipend will depend on whether they are pursuing a master’s or doctoral degree. Department faculty work closely with Gateway students to provide guidance and mentorship. Following the summer experience, all Gateway students are offered continued mentorship throughout their matriculation at the University of Georgia. The Gateway program seeks to foster the varied educational experiences that help all students to be prepared for an increasingly diverse society and workforce. The Gateway program will not only benefit these incoming graduate students, but also enrich the University of Georgia graduate community with greater diversity. By doing so, the program will instill in the student body different perspectives for the classroom, while continuing to enhance the workforce and society, by bringing greater numbers of students from diverse backgrounds to our campus. Students who have been admitted to the University of Georgia with funding for the upcoming fall semester must be nominated by their Graduate Coordinator to participate in the Gateway program. Interested students should contact the Office of Recruitment and Diversity Initiatives at grecruit@uga.edu or 706-542-6416 or their departmental Graduate Coordinator to learn more about the nomination process.